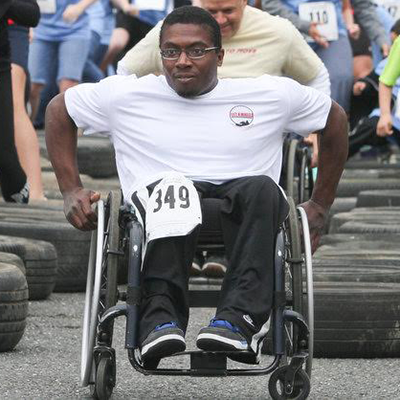 Born with Spina Bifida, wheelchair-athlete Chris Fletcher used to be on a team of wheelchair racers, but as scheduling challenges got in the way, he started searching for other creative ways to compete. “Most of the apps out there seem to either be geared on the one end toward those with limited mobility or else paralympians training to compete at the national or international level. There aren’t a lot of programs for people just excercising recreationally,” says Fletcher. Chris Fletcher loves the motivation sparked by virtual racing against colleagues . In September of 2015, Fletcher learned about an inclusive virtual race and fundraiser powered by Racery. The race was sponsored by Powered to Move, a non-profit organization led by Mike King, a paraplegic who overcame his motorcycle accident-caused disability by pushing a wheelchair 5,605.8 miles from Fairbanks, Alaska to Washington, D.C in 120 days. 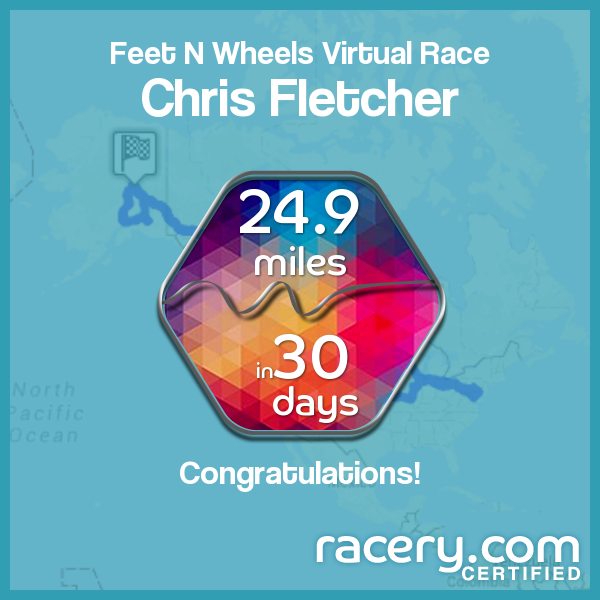 Wheeling 24.9 miles over the course of 30 days, Fletcher joined the world of virtual racing as @ChristoFletch and competed with both runners and walkers. Once the Powered to Move race was over, Fletcher, 27, decided to stoke his competitive streak by starting a virtual workplace challenge with coworkers at a wholesale food distribution company in Pennsylvania. “I’m pretty competitive and do a lot better when there are other people involved,” explains Fletcher. Competition makes fitness contagious, says Fletcher, pointing out that a colleague now runs 25 miles a week thanks to the virtual races. Bling from the Feet and Wheels Virtual Race. Fletcher also likes Racery’s “my trek” feature, which steadily accumulates miles in a 4,000 mile personal voyage from Disneyworld in Florida to Denali in Alaska. To keep his miles growing when he isn’t able to make it to a local park, Fletcher has purchased a table-top stationary bike trainer. Want to start your own inclusive virtual race for friends or coworkers? You can fill out this form to get started, or try building your own custom virtual race route. Bike around the world from home while challenging your friends to an online competition!